Oh how we love this chili, and by we I mean all 4 of us! Even the pickiest, who generally won’t eat chili, ate this up (granted she just ate the big chunks of steak, but at least she ate it rather than turning her nose up)! 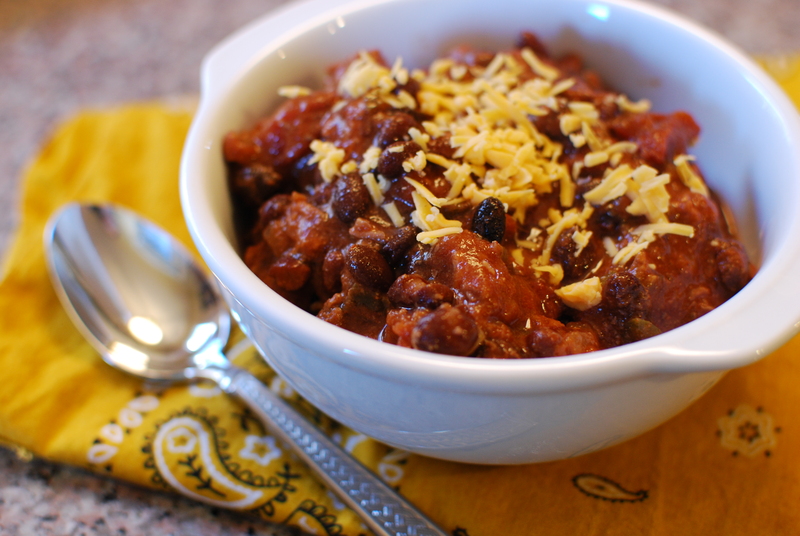 This is a true Crockpot chili, and I love that this dish actually cooks all day. Start it in the morning and 8-10 hours later, dinner is ready! Definitely can’t beat that for a busy weeknight delicious and hearty dinner. Serve with Grandma Clark’s cornbread. Place beef in slow cooker and turn it on low. Sprinkle the chili powder, garlic powder and cumin over the meat. Drain and rinse the cans of beans and add them to the slow cooker. Uncover and sir in the tomato paste.